S.K. Falls Archives - Book.Blog.Bake. Secret for a Song is not a light read, but it was a fascinating look inside the mind of someone with Munchhausen’s syndrome. As the summary suggests, Saylor does everything she can to make her self sick for attention, sometimes going to great lengths to do so. It’s hard to understand why Saylor would do the things she does, but I think Secret for a Song does a good job of really getting inside Saylor’s head and her thoughts as much as possible. The entire read, I was torn between feeling so sympathetic for Saylor and being so disappointed in her actions, but I thought S.K. Falls was skilled enough to create a character who isn’t very likable on the surface, but has a lot of hidden depths and is in an interesting situation. 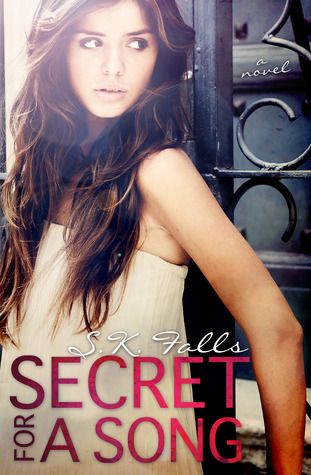 I suppose Secret for a Song is really a New Adult title, since Saylor’s college-aged, and the book definitely deals with certain things a little more graphically than a YA book might. I really appreciated this AS a New Adult title, because it definitely doesn’t fit in the stereotypical New Adult mold that many people complain about. Saylor’s issue is not glamorized and sometimes it’s hard to read about, but it’s depicted fairly and as much as I can tell, accurately. The romance in this book is pretty interesting. On one hand, you have Drew, the boy with the terminal illness whose disease is slowly taking away his ability to walk, use his muscles correctly, and have the quality of life most people in their early twenties do. On the other hand is Saylor, who is also sick, but whose illness is a mental one and who desires the attention the physically sick get. This isn’t a romantic portrayal that I as a reader root for, necessarily, but I think it showed a lot about both Drew and Saylor. At it’s core, this is a really character-driven book, which made it a bit hard to read at times. After all, I don’t really LIKE Saylor, but I’m interested in her situation. There’s subplot with Saylor’s family as well, and while her family is at the height of dysfunction, I think S.K. Falls did a good job of putting all the pieces together. There’s not terribly much of a plot in this book, but I don’t consider that a bad thing since it’s so character-driven. Most of the book consist of Saylor hanging out with her new friends, watching them cope with the diseases they actually have, and her Munchhausen’s and how it effects the way she keeps secrets from them. While I wish the truth had come out sooner, the way it happened in this book was really one of the only believable ways. Final Impression: Secret for a Song was tough to read at times, but I thought it was an interesting and sad look at someone with such a hard-to-understand mental illness. Saylor was a great main character, someone who’s not exactly likable but sympathetic, and while I was sometimes frustrated with her actions, I also pitied her. I’d recommend this one, especially if you’re liking for a New Adult that’s different and tackles some pretty serious issues. 4/5 cupcake.